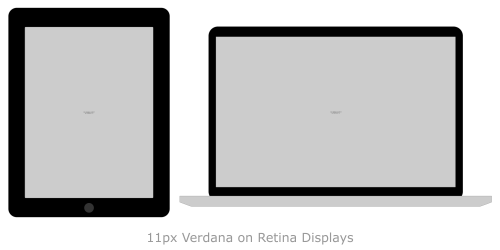 Do you remember the days of 11px Verdana used almost universally across the web? This how it looks relative to the new high resolution devices with Retina displays. Here is a sample page with some text set in 11px Verdana. It would be great if you could snap a photo of this page being rendered on one of the high resolution screens. Use the hashtag #11pxverdana.